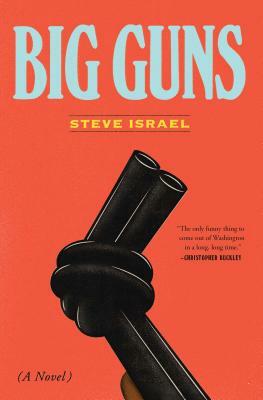 From Steve Israel, the Congressman-turned-novelist who writes “in the full-tilt style of Carl Hiaasen” (The Washington Post), a comic tale of the mighty firearm industry, a small Long Island town, and Washington politics: “Congress should pass a law making Big Guns mandatory reading for themselves” (Nelson DeMille). When Chicago’s Mayor Michael Rodriguez starts a national campaign to ban handguns from America’s cities, towns, and villages, Otis Cogsworth, the wealthy chairman and CEO of a huge arms company in Asabogue, Long Island, is worried. In response, he and lobbyist Sunny McCarthy convince an Arkansas congressman to introduce federal legislation mandating that every American must own a firearm. Events soon escalate. Asabogue’s Mayor Lois Leibowitz passes an ordinance to ban guns in the town—right in Otis Cogsworth’s backyard. Otis retaliates by orchestrating a recall election against Lois and Jack Steele, a rich town resident, runs against her. Even though the election is for the mayor of a small village on Long Island, Steele brings in the big guns of American politics to defeat Lois. Soon, thousands of pro-gun and anti-gun partisans descend on Asabogue, and the bucolic town becomes a tinderbox. Meanwhile, Washington politicians in both parties are caught between a mighty gun lobby and the absurdity of requiring that every American, with waivers for children under age four, carry a gun. What ensues is a discomfiting, hilarious indictment of the state of American politics. “New York congressman-turned-novelist Steve Israel delivers a second brilliant political satire” (Booklist, starred review). “An entertaining satire” (Kirkus Reviews, starred review), Big Guns is “a wonderfully irreverent satire about the fractured and fractious American political and lobbying system…a rollicking comedic trip” (Publishers Weekly).